Vulnerability is a key attribute to all healthy leaders and to living a healthy life. Let’s face it, we all have times when we are struggling, when we are uncertain, or where we are living outside of our comfort zone. Your ability to express this in a way that is honest but not weak, is the true attribute of a strong leader. P.S. We take the human approach to leadership and team development. Connect with Lee Grant at 1-877-256-2569 x 400 or lee.grant@careerjoy.com for information regarding our programs and workshops. P.P.S. 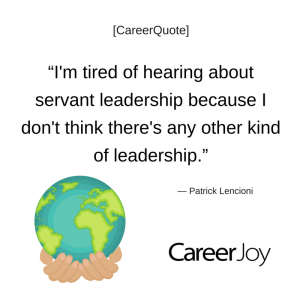 RSVP to our upcoming CareerClass webinar: Leadership Begins With You! Wednesday September 20 2017 @ 12:00 pm ET. Click HERE to join us!